ABC Marketing can create custom content for your social media campaign including sales messages, events, infographics, humor, contests, polls and industry specific news. ABC Marketing can create custom content for your social media campaign including sales messages, events, infographics, humor, contests, polls and industry specific news. When people view your page they will have something relevant to their interests that will draw them in and engage them. The goal being to get your readers to share your content in their newsfeed and thus, bring in more readers and potential customers. By assisting you in your social media campaign ABC Marketing will increase the chances of your content going viral and growing your brand. We target all of your content towards the interests of your customers and the keywords we are using to rank your website through search engine optimization. Twitter is another popular social media outlet. Twitter sees 340 million "Tweets" a day, making it another valid option for keeping in touch with your clients. 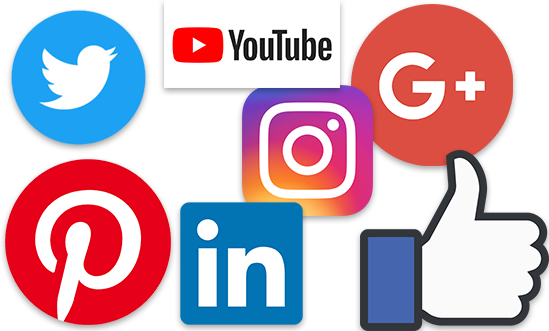 By representing your company in the social media outlets online, you are opening your business to millions of people that may have otherwise never heard of you. Give the professionals at ABC Marketing a call to get started with your Twitter today. Google Plus is a social network from Google. Some of its tools and features come from existing services and platforms, such as the Picasa photo storing and sharing platform. Some of the features are similar to other popular social networks and blogging platforms. Instagram is an online photo and video sharing social media service that gives you the ability to take pictures and videos, and share them either publicly or privately on the web. Instagram can be integrated with other social media platforms such as Facebook and Twitter. LinkedIn is a social media platform that specializes in businesses. They are the largest professional network in the world and can help you form businness-to-business relationships online. Pinterest is a social network that allows users to share their interests by posting (or 'pinning') images or videos to their own or others' boards much like posting to your "wall" in Facebook. Your board is organized into a collection of pins with a common theme making them easy to find by users with an interest in your marketplace. YouTube is a free video sharing website that makes it easy to watch online videos. You can even create and upload your own videos to share with others. YouTube is an extremely powerful tool if used properly to market your business. Share videos of your products or services to millions of users. Studies show that customers are 60% more likely to buy after watching a video. Let ABC Marketing get you set up and creating your own videos on YouTube today!